Hazelnutt House: No more mushy soap bars! No more mushy soap bars! Hihi friends of Hazelnutt House! I am currently using this bar of Badger Rose Geranium soap bar which I bought from iHerb. I do not have a place for a soap dish in my shower area. 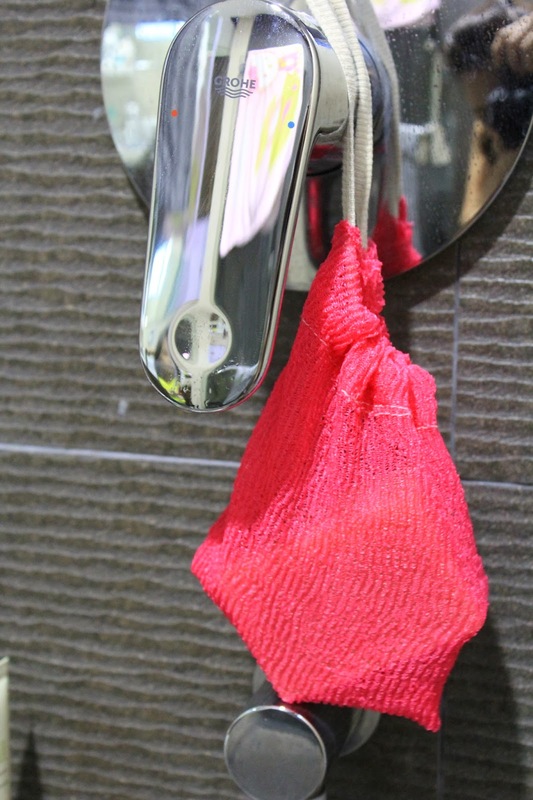 So, I came up with this idea of storing the soap in a pouch so that it will not be exposed to 'excessive flooding' while it stays in the shower. 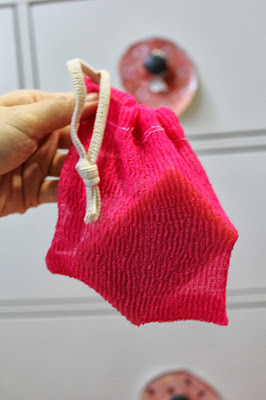 So, I cut out a small portion of the shower cloth and made it into a simple drawstring pouch. I keep the soap in the pouch in the shower area. For the first few days, I took the bar of soap out and placed it back into the pouch to air dry after use. Then I decided why not just use it while it is still in the pouch?! And so, I did and I love it this way. Instead of lathering it and transferring the lather onto a loofah, I simply wet the pouch with the bar of soap inside it and used it as I would a loofah, all over my body.